Addiction – Religion – Politics - Philosophy. This book is designed to get you thinking about several different subjects and offers some possible solutions! The idea for this book came to me while I was in prison. 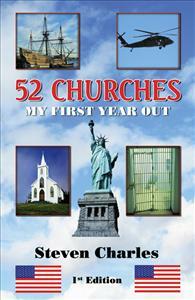 When I got out, I visited a different church every week for a year—in other words Fifty Two Churches. Its main purpose is to help addicts and their families understand addicts. It is also a brief overview of several different religions. Then, as if that isn’t enough, I give my opinion on several national and worldwide problems we all face and some possible solutions to them. A good friend of mine gave me this book to read and pass on after I was done. This compelled me to get one of my own and do the same after I read it again. The message in this book is very clear as to what options we have after any time a person has been incarcerated. Not only that it's easy reading with a message that I hope prevents a few of my biker friends from ever being incarcerated! Although I have never been, it does give a chill with an insight of what it was like without having to do the time. I recommend this book to anyone with a friend they care about that may be going down the wrong path. This is a startling revelation of how alcohol and drugs can affect an individual's life and others. It is a sincere report of a small portion of prison life in the hopes it will inspire others to realize that they do not want to be in that position. It is also a testimonial of how being focused on a project (visiting 52 churches), then writing about each one for an entire year can prove to others that setting a goal and sticking with it will provide results. In addition I appreciated the several references to issues in society which all of us need to focus on. Most of the churches the author visited were Christian related, however, the material presented would benefit anyone - regardless of religeous belief. It breaks my heart that a mature man who had so much going for him (career, own home, loving family, etc.) jeopardized and lost everything AND served time in prison - just for the sake of partying, alcohol and drugs. This book may help someone who is seeking to know more about God, types of religions and more - but most importantly, it just might prevent someone from making the same foolish mistakes as the author. I highly recommend getting a copy for yourself as well as a couple more to share with friends and acquaintances who may be seeking answers or heading down the wrong path. The reader can tell that this is the author's first book but that only makes the entries more real and heartfelt. Reading the book makes you want to know more about the author, the people mentioned and more about the churches - I look forward to the sequel!